Research related to on-premise signs and way finding is not a new topic. Scholars and professionals from the fields of engineering, business, marketing, art, architecture, planning, and law, have long produced scholarship in this area. However, this research has often been difficult to find because of its dispersal in publications across an array of fields. The interdisciplinary Journal of Signage and Wayfinding seeks to fill that gap. 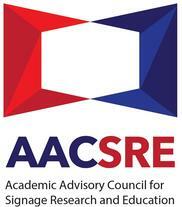 Sponsored by the Academic Advisory Council for Signage Research and Education (AACSRE), this on-line, open source journal seeks to be the home for scholarship in the field of signage and wayfinding, and to make that scholarship accessible to academics and practitioners alike. The first issue of this journal is currently in development and will be made available, at no charge, on December 31, 2016.